Davis Partnership Architects will soon be relocating our offices to a historic building in the RiNo neighborhood of Denver, Colorado, known as The Bindery on Blake. Valuing the environment and communities in which we work are fundamental to the Davis Partnership culture. In honor of our move to the historic arts district we are soliciting artists near and far to enter a competition for an opportunity to showcase a one-of-a-kind piece art installation in our new office. We have reserved two areas within our office where your masterpiece will become a permanent installation. The spaces are approximately 60’ x 20’ and 39’ x 13’ respectively. More details on the exact dimensions, deliverables and deadlines are included in the following materials. $10,000 and use of our gallery for your artwork to be displayed during a RiNo District First Friday! 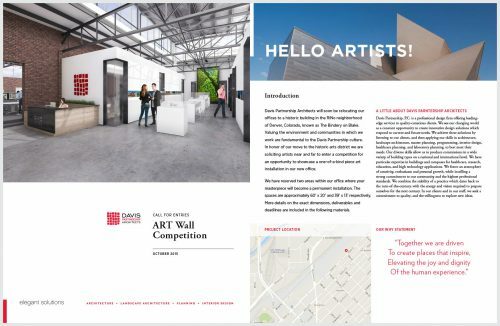 If you are interested in submitting or have any questions, shoot us an email at ArtWall@davispartnership.com.